With 10 years of successful production of OSMOTIC AQUATIC® THE PURIFIED ICE and over 100 million pounds of its icy purity put into millions of cups and coolers, the vision that began for this Virginia-based ice company in 1997 has become a positive reality. Brunswick Ice is pleased to have been the first International Packaged Ice Association member company to produce a purified ice product. We are proud of our commitment to package our purified ice in state-of-the-art material that meets FDA regulations and to buy that material from a packaging producer that meets the HACCP monitoring standards we require as an IPIA PIQCS PLUS ice producer. Our package is also the only process printed ice package produced in the U.S. by the Bemis Company. Additionally, all of our packaging is produced with lead-free printing inks. Everything we use to make and package our purified ice is produced in the United States. Brunswick Ice expands its commitment to products that keep food cold by introducing and distributing early Servel gas-powered single-zone refrigerators to southern Virginia. Rural electrification program reaches southern Virginia farms in the late 1940s. Electrification allows homeowners and businesses to enjoy new freezer-less electric single-zone refrigerators. However, many Brunswick Ice customers continued to depend on ice boxes and Brunswick Ice continues to serve their block ice customers. packaged ice as a transportable refrigerant for food in coolers and campers. Sports events open door to more volume uses of ice. New demand, shifts in market uses for packaged ice inspire changes in production and packaging technology. Brunswick Ice meets the growing need for packaged ice nuggets, identifies new market segments. 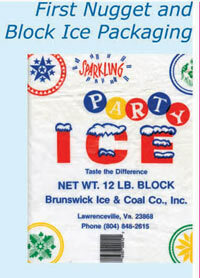 Introduces multiple size packages and names exciting new ice nuggets Sparkling Party Ice. Uses a package design that portrays the family’s early Pennsylvania heritage, signals their quality commitment  colorful Pennsylvania Dutch hex signs that represent harmony, good fortune, friendship, peace, strength and health. Sales rebound over 75% with first “Turbo” ice making machine installation. 1972 Brunswick Ice installs first nugget ice making and bagging machines. 1973 Adds five-ton “Turbo” ice making machine. ice made from water purified by reverse osmosis. by reverse osmosis reaches commercial viability. ice product trademark and package design. purified water is deaerated and frozen into crystal clear nuggets. new packaging and trademark. Distribution grows across south central Virginia. Ice Association to develop a packaged purified ice product for retail market. 1998 Capacity reaches 120 tons of purified ice per day. Brunswick Ice brand of purified ice. The new millennium consumer shows serious interest in bottled water; purified bottled water leads market. Brunswick Ice meets purified water popularity with SERIOUS ICE  a purified packaged ice. Samples of OSMOTIC AQUATIC®THE PURIFIED ICE pass independent purified water test requirements under U.S. Pharmacopeia guidelines. 2003 Brunswick Ice not only meets the IPIA Packaged Ice Quality Control Standards but also meets the requirements of the Hazard Analysis/Critical Control Point System; becomes first U.S. ice producer to attain combined ice quality and food safety PIQCS PLUS designation. Brunswick Ice has consistently retained its PIQCS PLUS annual certification. product under the Virginia’s Finest Program. 100 million pounds of purified ice sold. launches its new 2007 package. © 2002-2007 Brunswick Ice & Coal Company, Inc. All Rights Reserved. OSMOTIC AQUATIC is a registered trademark of Brunswick Ice & Coal Company, Inc.